One more wedding in the South of France and this time in Saint Jean Cap Ferrat. 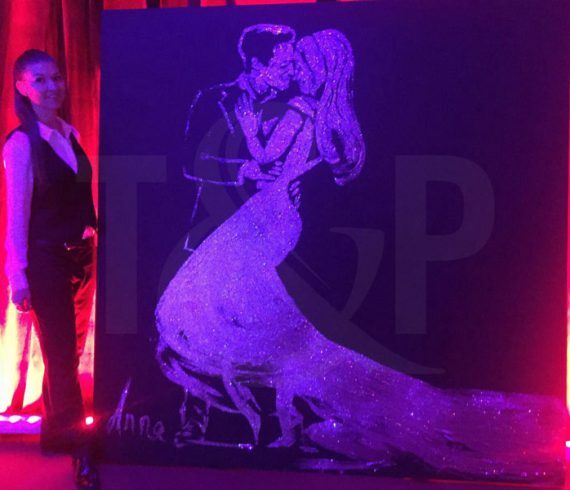 As a wedding entertainment, clients had requested to have a portrait of the bride and groom. A nice painting realized only with glue and glitters as a souvenir. Our agency was in Portofino, Italy with some great wedding entertainment. Our Monte-Carlo Singers band flew to portofino to entertain some happy few in Portofino. The wedding event took place at the Hotel La Cervara. The complex is especially suited to important events or meetings that require discretion… or simply an attitude of dignified concentration. The unique, varied structure allows you to hold different portions of an event in different places or settings while fully appreciating the incomparable landscapes offered by the centuries-old Abbey. Monte-Carlo Singers did a tremendous job entertaining guests till late at night starting with a duo piano/voice and at the end, we got many positive comments from guests. Thanks to all for this beautiful moment in Portofino. We do love to work on the French Riviera especially when it is a sumptuous wedding. This time Villa Rothschild was definitely the place to be. This amazing venue in Saint Jean Cap Ferrat is the place where most of beautiful weddings are held. 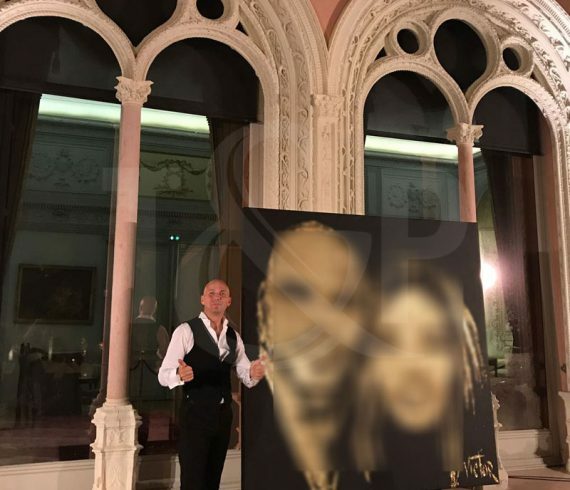 For this exclusive wedding we had our Live Speed Painter to realize the portrait of the brides using only glue and glitters in front of all guests. Besides the speed painter, the Giant white balloon was also part of the wedding event with the acrobat underneath for the wedding cake cutting ceremony! An absolutely amazing wedding event! Our entertainment company provided several acts for a wedding event that took place in Eze at the marvelous Cap Estel Hotel. Hotel Cap Estel is for sure the most beautiful and upscale hotel on the French Riviera. With its own private beach and it swimming pool by the sea, this venue is simply unique and amazing. For this particular wedding event we had many different acts to perform all night long: aerial acts, Mirror ball hand balance, Music LED dancers, … and even the top contortionist Pure contortion! This wedding event was like a true cabaret on air. We have never seen so many acts in one place for a private event. Congratulations to all for your wonderful work. Weddings on the French Riviera are not only held during summertime but also in Autumn thanks to the great and unique weather the south of France has to offer. Last week, we once again headed to the magnificent Grand Hotel de Saint Jean Cap Ferrat. The Grand-Hôtel du Cap-Ferrat has won many awards over the years, in recognition of the luxurious facilities and services provided at this 5-star hotel, which recently earned the prestigious “Palace” label. For this sumptuous wedding, we had to come up with some incredible entertainment. For this special occasion, we took a risk and brought the GIANT WHITE BALLOON. Why did take a risk as the event took place by the swimming pool and we had almost no place left to operate. Anyway, our performers are highly professionals and managed to bring the giant balloon very close to the wedding cake to handle the sword to the groom in order for him to cut the cake. A video of the event can be seen on our YOUTUBE channel. Our international entertainment agency was just once more in Switzerland and more precisely in Chambery in Geneva. This time it was to be part of a wonderful wedding by the lake. A crystal tent was built for the occasion and several entertainers traveled to Geneva for the occasion. Part of the whole entertainment package was our great strolling magician well known for being part of all upscale events and weddings worldwide.